For a lot of people, work is like a second home. They might spend more time at the job than they do in their own home. For Carolyn Weatherly and Audwin Mosby, Home Depot is so near and dear to their hearts that they took the unusual step of having their wedding at Home Depot in Lake Forest, California. Both of them work there, and both of them say that their coworkers are just like family, so… why not have it on the clock? The couple, both in their mid-50’s, had their wedding in the garden department at Home Depot in front of 100 guests, most of whom were wearing orange smocks (the bride was wearing traditional white). They built their wedding arbor and a stage from supplies there in the store, no doubt using their collective employee discounts to save a little extra money. If only they had built the minister, too! 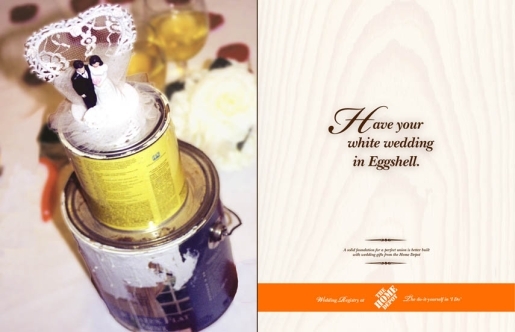 A regional manager for Home Depot says it’s only the second wedding performed at the chain, which boasts 2193 locations throughout the world.